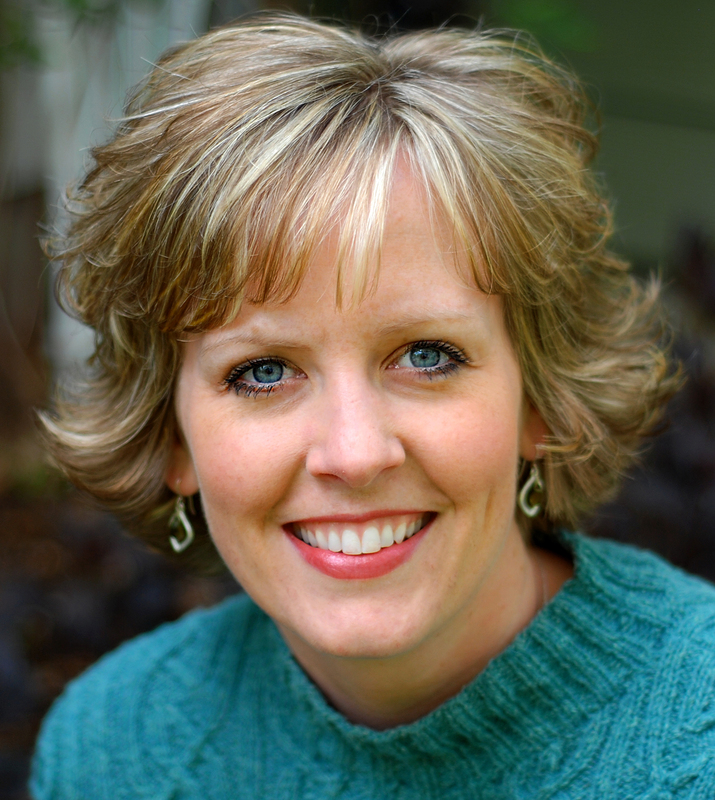 Hello – You have reached the blog of Heather Mulder Peterson. 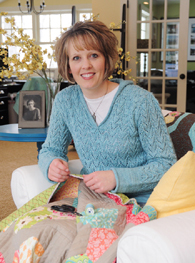 I’m a quilt pattern and fabric designer, working under the business name of Anka’s Treasures. We hope you’ll stop by often and leave a little more inspired! I began quilting as a freshman in college and found myself immediately addicted. I soon began pursuing my quilting as a possible career. I’ve been in business since 1996, starting small while working on my sophomore year in college. I initially did custom machine quilting and published a few patterns. Once I graduated, I began designing full time, doing books, patterns and fabric, along with lecturing and teaching. I am currently working on my 30th book, have done numerous single patterns and am completing my 20th fabric collection. The designs in my books and patterns are geared to the average busy quilter and many have several tricks that make them easier to assemble than they first appear. My business is named after my Great Grandma, Anka Petersen. She was an inspirational person to me for many reasons. First of all, she got my Mom sewing, who in turn got me sewing. She was 98 when she died, almost blind, living in an apartment by herself, and still able to totally take care of herself. She was in good health and so sharp mentally. I can’t remember what I did yesterday, yet she could rattle off telephone numbers from when she was a telephone operator in the 1930’s. I wish I could have inherited her memory! Instead I inherited her love of working with her hands. We both loved to be busy, sewing, knitting, gardening, crafting, reading, cooking, etc. I not only cherished her for all these reasons, but also for her great outlook on life. She had lived through so many hardships, yet she remained a woman of great faith and encouragement. My husband Joel and I live near Spicer, MN. We have two young sons – Carter and Maxwell. I have a studio above our garage and office out of our home. Our home is on a lake so we love summer and spending time outside on the water. We also enjoy biking, playing pickleball and doing house projects. In the winter we enjoy reading and watching the MN Timberwolves. My other hobbies include knitting and doing handwork. I just received the latest American Patchwork & Quilting magazine and love your article. What I am most interested in is the Autumn Days wall hanging. I started quilting about five years ago. I work fulltime and have two children at home still so don’t have a whole lot of time to quilt. But Someday!!! Can you tell me where I can get the patern for the Autumn Days wall hanging? I have been “On A Roll” several times in the last few months! I was so excited when I read about you in APQ. I am interested in the pattern for Autumn Days but I am unable to find it. I read your blog and it was very helpful listing the quilt books the quilts were in but I did not see A Season of Change. I hope that it is not out of print. Your website is great……. Anyway- saw your article today in my APQ that came in the mail. Looked really good- you must be proud (as you should be)! You, Leah, and I should get together for a quilt day before Leahs next baby comes along! I just bought your book “The Sweet Life” and love the quilt made with the Sole fabric (pg 4 also pictured above). I was wondering what the fabric for the stripe and white with dot fabric line is? Hi, can you tell me the name of the pattern for your blog quilt in your header? Is it in a book or sold separtely. I have enjoyed reading your blog. Thank you. I love your designs. I just bought 2 of your leaflets. I’m interested in knowing what fabric line you used for the “Cotton Candy” quilt featured on one cover. I am a novice quilter and have found your patterns to be just perfect for me. My fist full-size quilt was from “Fat Quarter Five” and I just purchased the ‘Double Takes II’ pattern and hope to start it soon. Your new ‘Birthday Collection’ is just adorable and I no doubt will buy it ay my local quilt shop soon! Keep up the inspirations coming! I just saw where you wanted us to list our favorite blogs. I have one that I really love! http://www.southernplate.com . It features recipes from the South with full pictorials and recipes. If you love cooking (or want to learn how to cook) traditional recipes check it out. I think you will love it as much as I do! I just typed a long comment and I don’t think it went through. Just my luck. I wanted you to know that I have loved your work for a long time, probably since your first book. A fellow quilter just suggested I go on this site and comment. It was so fun reaking your blog. Heather, I just wanted to tell you that I just love your fabric Cottage Charm. The fabric is so soft and nice and the colors are great. Now if I can bear to cut it up I’ll give it a try with my Little Charmers Five pattern. Great Fabric – Great Pattern – Thanks! I am the program coordinator for the Material Girls Quilt Guild in St. Paul, MN. We are interested to know if you would be available to speak at one of our meetings in 2009. We presently have March, May, June, July, August, October, and November open. Please let me know what fee you charge. Love your work. I have just started to make ”shooting star’ from Fat Quarter Cottage. I have a question regarding it, could you please contact me. Keep up your great work. I wanted you to know I have listed your blog on the new web site Quilt Qua. The address is http://www.quiltqua.com/links/blogs/ It would be great to have a mention on your blog, if you would like to share the info. Also, let me know if you put a mention or link on your blog, as we feature the blogs that do that on the top list of our blogs. Also, I would like to list your products on the site, but I’m not sure where you would like to be located. I’m working on a book section, that isn’t on the site yet – so I’m looking for exerpts, and then there would be a link to the purchase point. Hi Heather. It was nice to see you again at Lake Beauty. I am still interested in the purchase of your used quilting machine. Sorry I didnt’ get back to you sooner. Please let me know if it is available. Take care. I don’t blog but would love to receive an early copy of your new book, Stop, Drop and Roll! Thank you for the help with the continuous bias cut binding – it’s illustrated so I can actually do it. Your books and fabrics are always awesome and fun, easy to make and beautiful when completed! I just ordered your pattern, Double Take III. I can’t wait to get started and would like to purchase fabric. Could you email me the fabric requirements? I LOVE the pictures of the remodel — it’s beautiful! I just received your new book, Stop, Drop and Roll in the mail and I LOVE it! I am horrible at picking out colors for quilts which is why I love the collection of fabrics. I want to do the All Wrapped Up quilt (the simple version) in Arcadia by Sanae but I don’t know what color would be best to replace your dark pink in the pattern. Any suggestions? I’m looking for a copy of On A Roll Again. I tried to order it on Amazon and they said it wasn’t available. Any idea when they might have it again? Thanks. I really like your blog. I am fairly new to quilting and have done just a few wall hangings. I love the quilt that you are holding. What is the name of it and where might I be able to find the pattern for it? Thank you for your help! How darling that appliqued “charmed” pattern is! I am especially pleased with the way that you designed the petals of the flowers to go over the framing borders! Nice “casual” style that I hope to try soon! I enjoyed reading about your Grandma. It was the ladies in my family – Great Grandma Lillie, my Grandma Goldie, and my mother Mary – that also inspired me to sew, embroider and quilt. I would be lost without needle and thread!! Glad you enjoyed your trip to Montana. Loved the trunk show and quilting day! Your presentation inspired my young daughter (9 yrs) and my niece (21 yrs). My niece actually bought a sewing machine shortly after your visit and has already finished a first quilting project! I am so thrilled with the giveaway package that arrived today in the post. The charm squares are beautiful and all those glorious patterns- I don’t know which pattern to pick first. Thank you for the generous prize – it was such a beautiful gift and really brightened my day. Love the woolie pattern you have on the shop hop today. I really enjoy your blog and patterns! Love the colors! I too was married to a Joel Mulder, originally from Muskegon, MI. We are divorced and I live in Berkeley, CA. (Joel is a soccer player, camper, and an outdoorsman. But, my Email has to do with your quilting. First, are your designs for sale? I love them for their simplicity, yet their striking colors and combinations. I have taken a quilting course, but somehow, I don’t have the patience for small pieces, and insecure about color combinations. Somehow, I am sensing that I may be interested in one of yours. I will let you know which ones. Thank you. love your website & tips! I just stumbled across your site and am already addicted! I’m very excited to learn more. Thanks for sharing! I love your site and have put it on my favorites. I see you are going to Lake Beauty. I have been there several times and love it. I love your fabric. I just finished your Christmas quilt At Home for the Holidays. Everyone that I show it to loves the black and white print. I now have to quilt it. Thanks for a great site and letting us be a part of your world. I’ve loved your patterns for several years and just stumbled onto your blog. I am so in love with your home and your decorating as well now!! Thanks for sharing! Can’t wait to see more. I am fascinated by your blog!! You are so talented. Congratulations on the birth of your son. Do you happen to know who makes the seaside cottage fabric? Henry Glass Fabrics – though that line is out of print now. Thank you for this wonderful site. I am sure to wander back here often. I feel honored that I have the same first name as your Grandma. I have yet to meet another Anka! So nice to “meet” you and thanks for stopping by and sharing some nice comments. My Grandma Anka was German – tho My grandparents on the other side were 100% Dutch. I spent the first 6 years of my life in an almost all Dutch town – with lots of windmills in yards, etc. Can I ask where you immigrated to? here is a page about our trip to America. We lived in Littleton MA, than moved to Newark, Delaware. From there to AZ to Ca and finally to Washington. My parents both passed away over four years ago and my sister lives in Federal Way, Wa. and my brother lives in the Phillippines.